Evidence indicates Russian contract soldiers were operating in Syria in October. Fontanka.ru, a news agency based in St. Petersburg, has reported that as many as 267 Russian contractors were stationed near Pres. Bashar Al Assad’s home province of Latakia in the beginning of October. The soldiers were members of a private military corporation based in Hong Kong named the Slavonic Corps and were originally assigned to “guard” several oil fields near Deir ez Zor, a city in eastern Syria that has seen intense fighting and jihadification by Al Qaeda-affiliated group Islamic State of Iraq and Sham, a.k.a. ISIS. However, it appears that the oil fields that the Russians were supposed to be guarding were under rebel control, and the team was tasked with getting them back. On Oct. 18, the Slavonic Corps engaged members of ISIS in As Sukhnah, halfway between Deir ez Zor to the east and the ancient ruins of Palmyra in central Syria. The clash resulted in injuries to six Slavonic Corps soldiers, eventually forcing the group to retreat. One Russian contractor involved in the firefight recalled that a sandstorm saved the group from the mujahideen because their vehicles were concealed as they escaped. 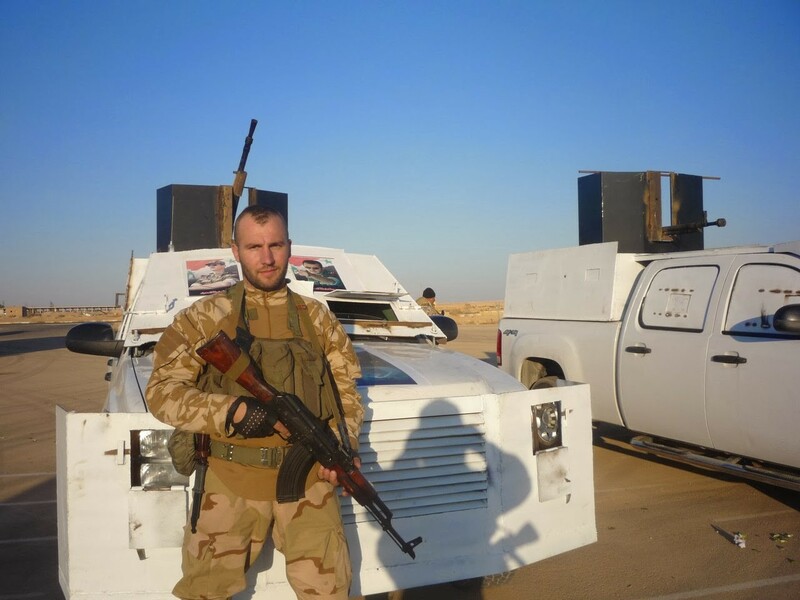 However, during the withdrawal, another contractor named Aleksei Malyuta dropped his ID, which was later recovered by ISIS fighters. Malyuta’s identification card indicates that he was employed by the Moran Security Group, a security and defense consortium associated with Slavonic Corps. Lt. Col. Vyacheslav Kalashnikov, an officer in the Russian Federal Security Service—the FSB—was also allegedly involved with the Moran Security Group, seeming to imply that the Kremlin has been aware of its nationals fighting in Syria. But a leading FSB contractor claimed that the Slavonic Corps mission was actually a false flag operation, according to Interpreter. The contractor said the fake company was set up by opposition forces in order to lure the Russians into an ambush. Reportedly, the rebels would have used the mercs’ bodies for propaganda purposes. In Syria, each contractor was reportedly promised $4,000 a month for his services. The Russians were transported from Beirut to Damascus by car, accompanied by Syrian gunman, and then flown from Damascus to an air base in Latakia where they were given antiquated and unusable weaponry. The contractors ended up driving Hyundai buses and GMC trucks that were “lined with homemade armor.” It should also be noted that Slavonic Corps is less than two years old and could be considered a “fledgling” and inexperienced PMC. Following the botched operation in As Sukhnah, Slavonic Corps, which had intended to spend five months in Syria, pulled out after Malyuta’s captured identity card raised eyebrows within the international community. Upon Slavonic Corps’ exodus from Syria, two members of the consortium Moran Security Group, Vadim Gusev and Evgeny Sidorov, were arrested by the FSB in Russia. The two contractors were charged, for the first time in the history of the Russian Federation, with violating Article 359 of the Criminal Code, which pertains to mercenary activities. Russia is far from the only country with nationals fighting inside Syria. Iran has been accused of supplying Assad with troops particularly to protect strategic military bases, some of which were previously used to hold chemical weapons like the embattled stronghold Al Safira outside of Aleppo. Last month a 20-minute video surfaced that showed 150 fighters from Kazakhstan who traveled to Syria to wage jihad. And recently, Al Qaeda fighters in northern Syria have been cited saying that there are French, British and Dutch in their ranks. You can follow @Mitch_Swenson on Twitter. Sign up for a daily War is Boring email update here. Subscribe to WIB’s RSS feed here and follow the main page here.